A resolution was passed 231 years ago to hang a portrait of Bernardo de Galvez on the walls of Congress. It’s now on display. Galvez's portrait hangs on the wall of the Senate Foreign Relations Committee room inside the Capitol. Sen. Robert Menendez (D-NJ) oversaw the task. The painting joins a statue outside the State Department in honoring the Spaniard’s service to the fledgling United States. While Governor of Louisiana, Galvez helped smuggle weapons and supplies up the Mississippi River to the American revolutionaries. The army he raised also captured four British forts, including Fort George during the Battle of Pensacola in 1781. Actor Chaz Mena portrayed Galvez in a one-man play at WSRE-TV last year. Before the production, Mena sat down with WUWF’s Sandra Averhart to give his take on the battle, and researching the man who was Bernardo de Galvez. Although Galveston, Texas, and Galvez, Louisiana are named after him, Galvez is not prominent in American history, according to Ramon Gil-Casares, Spain’s Ambassador to the U.S. During the inaugural Galvez Day in Pensacola two years ago Annalia Galvez,a direct descendent, said that he’s not that well-known in Spain, either. “In Malaga (Province) thanks to Mayor Antonio Campos, he’s getting well-known,” she said. That could be changing even more. Macharaviaya, the Spanish town where Galvez was born, considers him a hero. Mayor Antonio Campos touched on Galvez’ stature during the 2013 ceremony at Fort George. Campos added that Macharaviaya celebrates on July 4, pays tribute to the Battle of Pensacola, and remembers Galvez’ legacy. George Washington recognized Galvez' victories as a deciding factor in the Revolutionary War. And his assistance illustrates the 200-plus year relationship between Spain and the United States. Resolutions granting Bernardo de Galvez honorary American citizenship were passed by the House last July, and the Senate earlier this month. Others in that rarefied atmosphere include Winston Churchill, humanitarian Raoul Wallenberg, and Mother Teresa. 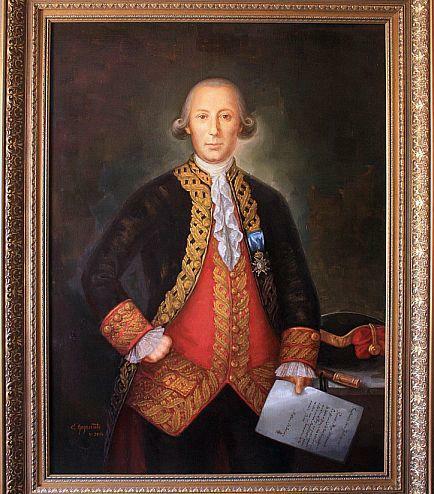 May 8th was designated “Bernardo de Galvez Day” in Pensacola, where the Spanish general led a 61-day siege in 1781 to oust the British from northwest Florida, in what many call a key battle of the American Revolution.